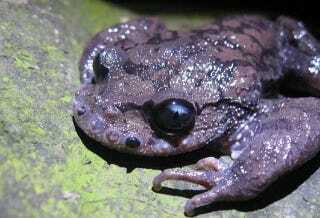 Male Emei mustache toads usher in the mating season with a new look. They grow a long ridge of spines along their mouths, and use those spines to slash the hell out of other males. Learn about the fine art of mustache dueling. Leptobrachium boringii are, for most of the year, gentle souls. They spend their time looking for food in streams in the south-west of China and gathering their strength for mating season. When the season starts up, it’s time to grow face-armor and to learn how to use it. And these toads use it a hell of a lot. The males pick a nesting site and defend it as long as they can. That’s a tough thing to do when “defense” means trading head-buts to the belly with a competitor who has grown between ten and sixteen spikes around his mouth. Though the toads are merciless fighters, they are generous conquerors. When a toad takes over a nesting site, it leaves the clusters of eggs that its rival has fertilized alone. It could easily destroy them, but for some reason it doesn’t. Researchers speculate that being surrounded by eggs make the toad look like a stud to female toads. On the other hand, the males fight often, and often lose established nest sites. Maybe a male is more likely to get their DNA into the gene pool if they don’t destroy other males’ eggs, and trust other males not to destroy theirs. Image: Cameron M. Hudson, Jinzhong Fu.